It's been a great half-decade to be an investor in these three stocks. The S&P 500 has risen more than 105% over the last five years, if you account for dividend reinvestment. That's a big enough gain to turn a $10,000 investment into a cool $20,500. While that's a great five-year run, a handful of stocks have left the famous index in the dust over this same time period. Here's a closer look at three such stocks -- Ionis Pharmaceuticals (NASDAQ:IONS), Teligent (NASDAQ:TLGT), and Dexcom (NASDAQ:DXCM) -- that are each up at least 500% over the last five years. This biotech's claim to fame was developing an innovative process called antisense that it uses to develop drugs. Ionis' technology allows compounds to be created that target and bind to RNA, which is what pumps out the proteins that cause diseases. Ionis' drugs can be used to reduce the amount of troublesome protein that end up in the body, thereby helping to treat the underlying disease. What's great about this technology is that Ionis can quickly churn out new drugs once a troublesome RNA target is identified. That has allowed the company to pack its pipeline full of dozens of drugs that are aimed a treating a wide range of diseases. That provides investors with multiple shots on goal. Beyond the broad pipeline, Ionis has been such a terrific investment over the last few years thanks to its ability to make believers out of other big pharma companies. Currently, the company boasts partnerships with Biogen, GlaxoSmithKline, Bayer, AstraZeneca, Roche, and more. Better still, these partners have been willing to shower Ionis with huge up-front cash payments to get their hands on the company's technology, which has kept the company's cash burn rates quite low. Looking ahead, Ionis is nearing the finish line with three new drugs. If it has regulatory success, it could put a permanent stop to the company's cash burn. That suggests there could be more share price appreciation coming in the years ahead. Teligent specializes in generic drug manufacturing, but with a twist. Instead of making copycat versions of top-selling small-molecule drugs, Teligent focuses exclusively on products from the topical, injectable, complex, and ophthalmic markets (think creams, lotions, and ointments). With each passing year, a number of new drugs in these categories lose patent protection, allowing Teligent to make a generic, send it in for FDA approval, and grab market share by selling it at a discount. The strategy has worked brilliantly. Teligent's sales have been rising rapidly over the last few years, taking shareholders on a profitable ride. The company's margins are also on the rise, which has allowed the company to finally become profitable. The odds look good that strong growth will continue from here, too. Teligent currently boasts 34 new products that are pending FDA approval, which management believes represent an addressable market opportunity of $1.6 billion. That's a massive opportunity for a company that's only expected to ring up $67 million in total sales this year. More than 29 million Americans were diagnosed with diabetes in 2012, and those numbers are steadily climbing higher with each passing year. This chronic disease disrupts the body's ability to properly maintain blood glucose levels, forcing patients to regularly monitor their levels with painful finger sticks. Roughly a decade ago, Dexcom launched an innovative medical device that allows for continuous-glucose-monitoring, making it far easier for people with diabetes to track their blood sugar levels in real time. 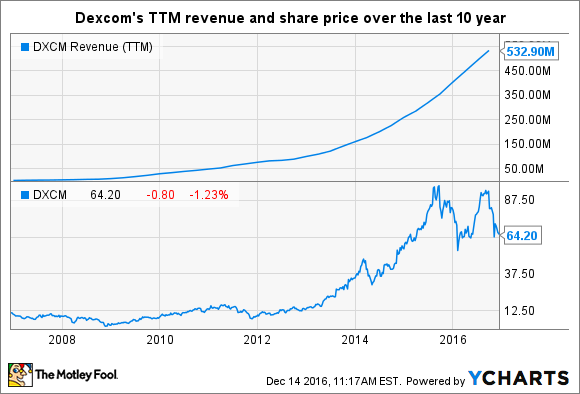 The diabetes community has largely embraced the company's technology with open arms, allowing Dexcom's revenue -- and share price -- to grow rapidly. With diabetes rates climbing around the world, Dexcom should have plenty of room left to grow in the years ahead. Now that the company's crazy valuation has become more reasonable, it might be a great time to give this company's stock a closer look.